Spring is ahead of schedule and so is the voodoo lily. I just added this to my garden last year and I expected it to take 2-3 years before it was ready to bloom. Maybe it was just so happy to have survived the crazy winter. Now it is ready to bloom x 2. This promises to be pretty spectacular. Stinky too. The blooms smell like rotting meat because this flower plans on attracting flies for pollination. I was trying to think of a way to say something nice about your voodoo lily despite it looking creepy, but now that you tell us it smells like rotting meat I won’t worry about it. Why, oh why did you get this? Hopefully the blossoms will be spectacular…in a lovely way. 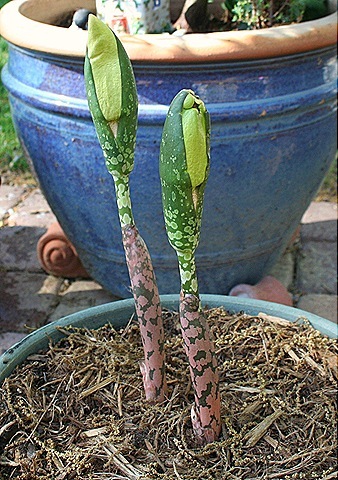 Very cool plant…did it winter outdoors? I would think it to be tropical. Can’t wait to see the flower! Oh wow I can’t wait till it’s all bloomed and smelly! Not so sure about the smell, but I love those colors and spots. And I do love a plant that’s clever like that. I’ll watch yours bloom from here, if you don’t mind. That thing is wicked cool! That plant reminds me of the movie Little Shop of Horrors!!! How funny…I wonder if they would grow in Northern California? I need one of those!! 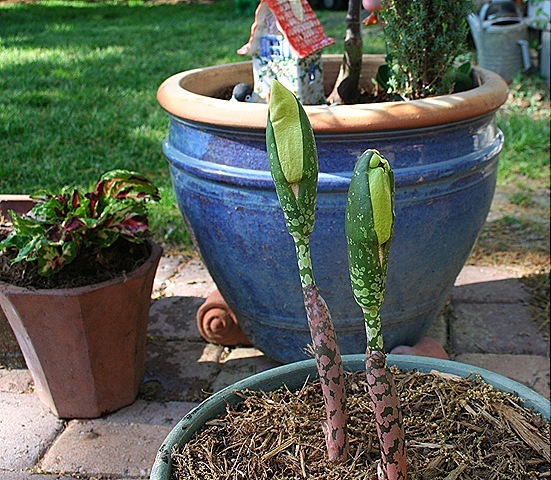 Suzy, you’re the first person I know who has grown one of these very exotic plants – can’t wait to see it open but glad I won’t have to smell it (I’m vegetarian, ha! ha!). Hope all is well – know you, like me, are keeping busy in the garden. Have fun. I’ve a new blog now – A Breath of Fresh Air – hope you stop by. Love the new flickr group!